Yesterday, 04 April, 2018 is what would have been the poet Dr Maya Angelou’s 90th birthday! She was born in St Louis, Missouri, and died in 2014 at the age of 86. Dr Angelou wrote more than 30 books, and had many different careers before becoming a poet/writer. To me, this poem “Still I Rise” says to keep focused, stay strong and be proud of yourself and your talents. You are a very important person, no matter what anyone thinks! You rock! Here’s the poem, and following is a YouTube video reading of “Still I Rise”, by myself. 😊I did my best to do this lovely, uplifting poem justice. 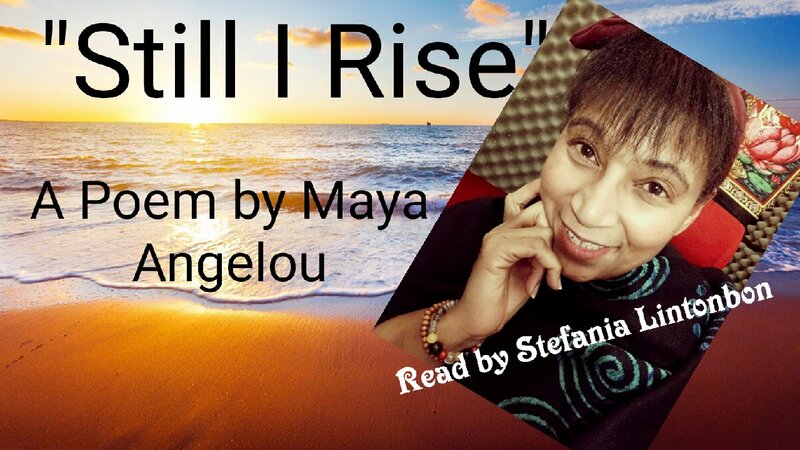 This entry was posted in Inspirational, Poetry, Spiritual, Uncategorized, Videos and tagged a blog a week, achieving goals, amazing life, Maya Angelou, modern poetry, motivational poems, poems, spoken word, stefsvoice4u, still I Rise, still rise. Bookmark the permalink.